TAKE TWO: Baby & Me 2 was designed to simplify your life. We know that it is challenging trying to remember to take four pills a day (hello pregnancy brain!). Our new formula allows you to get all the nutrients you and your growing baby need in just two tablets a day. 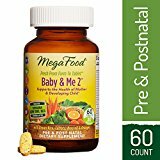 FOR YOUR GROWING BABY: Contains 600 mcg of Folate to support the healthy development of your growing baby. Folate, or folic acid, is critical in the early stages of development and is beneficial to be taken while trying to conceive and throughout all stages of pregnancy. FIND YOUR ENERGY: Contains 100% or more of all 8 FoodState B Vitamins for healthy energy and balanced mood and B6 to accommodate your body’s higher requirements during pregnancy. Also includes methylated Folate and B12, which is suitable for those unable to methylate. MADE FOR YOU: Specially designed to meet the unique needs of your body during and after pregnancy. Pregnant and breastfeeding women have a greater need for vitamin B6, and are at risk for biotin, and/or choline deficiency.